US Bank Stadium in Minneapolis, site of Super Bowl LII. 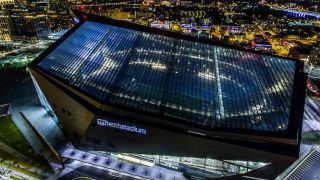 Photo: Marc Goodman Several events taking place at the Minneapolis Armory leading up to Super Bowl LII will utilize PureLink’s VIP Video-over-IP hardware and software systems. There will be several concerts at this venue both in the days before the professional football championship on February 4, 2018, and on game day itself. During all these events the Armory will need to effectively and efficiently route live and pre-recorded video content and other digital media from multiple sources to a variety of displays and monitors throughout this newly refurbished facility. With a number of pregame events and celebrations happening at the Armory this week, the facility's audiovisual infrastructure will be heavily utilized. The AV systems will have to operate at peak efficiency, routing multiple signals over their IP network to the appropriate destinations at the appropriate times. This will include live event broadcast truck feeds, prerecorded media content and messaging, as well as computer graphics and imagery. These signals will be sent either during performances, in between events, or in a constant stream to monitors and digital signage displays at the bars, luxury suites, shops, and other common areas within the facility.